On Hunger focuses on the interface between food and public health and on the flawed regulations intended to protect us. Food not only represents nourishment for the body; it also possesses other valuable aspects that are protected by international legal instruments. Westra argues for the importance of effecting radical changes: to protect and improve the present system of food production and distribution. Starting from several reports produced by the FAO and the WHO, Westra argues for the need of a complete and radical re-evaluatio of current practices and systems in order to meet the obligation of the international community to prevent hunger. There is a particular emphasis on the problems facing the poor in the third world, but also the different but equally grave problems of those in developed countries, where the emphasis remans on corporate profit rather than on the protection of individuals, as present dangers affect all, starting from the children of all ages. Most of the existing literature on hunger and food does not address the harm that current practices inflict on people globally. Laura Westra’s On Hunger focuses on the interface between food and public health and on the flawed regulations intended to protect us. Food not only represents nourishment for the body; it also possesses other valuable aspects that are protected by international legal instruments. Westra argues for the importance of effecting radical changes: to protect and improve the present system of food production and distribution. This timely book explores every aspect of this challenge, from the impact of climate change, the role of the media and obligations to future generations. Westra also considers the legality of financial contributions on the part of agribusiness to political figures and campaigns, as well as their intrusion in the drafting of bills and regulatory regimes. Finally, the book highlights more positive developments,including the expansion of the remit of the International Criminal Court to include environmental crimes. 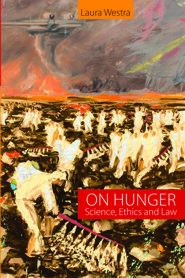 On Hunger offers an original take on this increasingly important issue and will provide fascinating reading for scholars and students in law, philosophy and human rights. Laura Westra has a unique talent to explore the dark forces in society that almost imperceptibly corrupt our daily life and the future of the planet. Food is not just a matter of nutrients or gastronomy, food is narrow-minded mass production with catastrophic potentials for the survival of our species. Like a detective, Dr. Westra discloses embarrassing facts that should make us reconsider our role as complacent food consumers. Laura Westra is a very courageous scholar. She is neither afraid of direct discussion of very controversial topics nor of the vested interests that protect the current unacceptable status quo. When ti comes to food issues her outrage emerges page after page with no loss of lucidity. A book that must be widely read. The ecological integrity of the planet is important for its health and for the sustainability of the health of humans who inhabit it. With her latest book Laura Westra has called attention to this important issue, why we should care about it, and what we should do about it. Her emphasis on the law is particularly notable. This book is a timely, well documented and truly innovative contribution to the literature of international law and international relations. Like clean air and water, healthy food is an essential need of human existence. This book explores all aspects around food, from production and availability to affordability and quality including socio-economic forces denying access to quality food. Crucially, the book offers legal and governmental avenues to control such forces and promote more sustainable forms of producing and consuming healthy food. Laura Westra has a Ph.D. in Philosophy from the University of Toronto, and a Ph.D. in Jurisprudence from Osgoode Hall Law School, and has taught in the fields of philosophy, ethics, and environmental law at several universities including University of Windsor, Canada and University of Parma, Italy. She has published 37 books (monographs and collections) and over 90 articles and chapters in books, and is the founder and director of the Global Ecological Integrity Group (GEIG) since 1992.